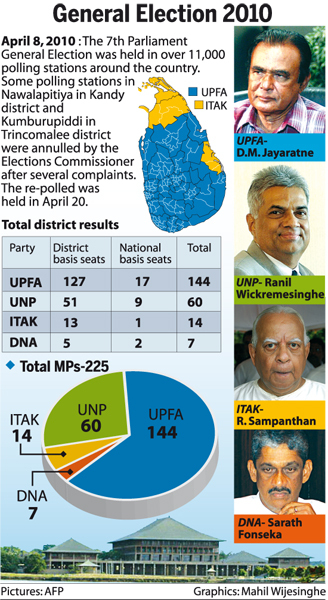 The Democratic People’s Front (DPF), which was denied a National List slot by the UNP led alliance - UNF, said that they have commenced a campaign against the UNP to prevent Tamils voting for the UNP, which has overlooked the minority representation in the new Parliament. It is time for the UNP leadership to be replaced with a leader such as Hambantota District MP Sajith Premadasa, said former Assistant Leader of the UNP Rukman Senanayake. The new Cabinet of Ministers of President Mahinda Rajapaksa saw drastic changes with not a single minister getting their former ministry or may be an aspired one, while rendering the wild speculations in the media null and void. Mahinda Chintana accomplished pledges - S.B.